MARK CATLIN is confident he has the support of Pompey’s prospective owners. The Blues chief executive believes he has the backing of American billionaire Michael Eisner ahead of his takeover being completed. 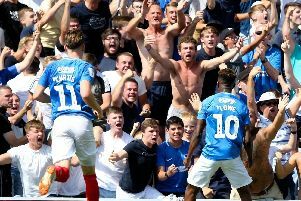 Eisner’s Tornante Company is continuing to press forward with their purchase, after being given the green light by Pompey Supporters’ Shareholders and the club’s presidents last month. Chairman Iain McInnes anticipates it being next month before the deal is completed. It was Catlin who was heavily involved in the appointment of Kenny Jackett as Paul Cook’s successor, while working with the existing board. Eisner was advised of developments during that process by the Londoner and remains upbeat they will have a positive working relationship moving forward. Catlin said: ‘We have adopted a mentality here that if you don’t trust the CEO – sack him. ‘Mr Eisner is really similar to the existing board in that way. ‘I’ve always had support from the existing board, and Michael has assured me I will have his backing as well moving forward. Catlin arrived as Pompey’s chief executive at the start of the club’s community era in 2013, with previous football experience at Bury. Within 18 months the club had cleared £7m worth of legacy debt – two years ahead of schedule. Catlin also saw himself named CEO of the year at the Football Business Awards last November.